I rise in support of the motion by Mdm Halimah Yacob to thank the President for his address. The President touched on several themes and I would like to focus on 3 of these – population, immigration and rooting Singaporeans here. The government’s history of dealing with population has been rather colourful. There was a recent past when family planning was paramount; Singaporeans even got financial incentives to sterilize themselves. Now, the government has realized the dangers of Singaporeans not producing enough babies. By 2030, 20% of Singaporeans will be over 65. The economists tell us that an aging population is less dynamic, results in skills shortages, and is a strain on public expenditure e.g. healthcare. To respond to the population challenge, one of the key ideas of the government is to welcome immigrants to churn the economy and to naturalise them as citizens. Let me state categorically that the Workers’ Party is not an anti-immigration party. We welcome foreigners who are able to contribute to our society and want to make Singapore their home. However, Sir, I believe that for immigration policies, clarity and calmness is needed. The government has made some general statements foreigners’ contributions such as creating jobs here and making Singapore vibrant. But it has been short on details of the liberalized policy. What specific desired outcomes are we aiming towards? The government should be transparent with Singaporeans on the rationale for the changes and their impact on Singaporeans. As it stands now, there is anxiety among Singaporeans as they do not know how living in Singapore will change in the 10 years’ time or even 5 years’ time. First, we have not been told what target population we are aiming towards. We know we are seeking to have more than 4 million people here, but how many more? The government has said it has no fixed target in mind but this seems somewhat shoddy. Shouldn’t setting a target be the first step from which we should work backwards to determine how many new immigrants we want? Secondly, what kind of immigrants are we interested in? The Prime Minister has said that we would recognize talent using more flexible criteria. While in principle this makes sense, how flexible we become is another matter. Since late 2004, the government has also broadened the criteria for assessing citizenship applications to include how the rest of the applicant’s family can integrate into Singapore society. This has apparently helped to increase the number of citizenships granted last year to nearly 13,000, which is a 70% increase from the previous year. This poses an interesting question. Even if people can integrate into our society, how much do they contribute to Singapore and do they have a net effect of benefiting us or becoming a cost to us? The government should carefully track these cases and inform Singaporeans of the cost-benefit of the policy change. Thirdly, the prospect of a more crowded Singapore should be carefully planned. Every new person fights for resources, takes up space and disposes of waste. The demands on healthcare services, public transport and the police will increase. How much investment do we need to make to cope with this influx? What would the island be like if we had a population increase from 4 million to 6 or 8 million? As it is, Singapore is already the 4th most densely populated region in the world at more than 6,000 persons per square km. Thus, although population growth will result in more economic activity, it does not necessarily lead to well-being. Next, if aging population is our concern, will bringing more immigrants to Singapore help the situation in the long run or perpetuate the problem? After all, everyone eventually grows old, including the immigrants. I believe it is well-known among policy-makers that immigration cannot compensate for population aging unless immigrants are brought in in very big numbers to replace the existing population, which leads us once again to ask what numbers we are talking about. Will immigrants have more children and help raise the fertility rate? There are foreign studies which show that fertility is directly related to optimism in the future and economic security. In other words, people tend to have children if they are confident that they can afford it and that the future of the society is bright. Based on what Singaporeans have said so far, local parents too have the similar concerns. Can they afford to raise the child? What future will the child have? Assuming immigrants become integrated into Singapore society, they may, over time, have similar worries as locals. The fertility rate for new citizens may become just as low. This would mean the problem of aging population will continue, and we may have to keep bringing in more and more new immigrants to churn the economy! Is this feasible? While we recognize that we have to address aging population, is there any need to panic and liberalise immigration overnight? It may be worth the government’s time to propose what our optimum population is, and focus on more sustainable policies. To address the low fertility and aging population, the government should focus on increasing fertility by making the choice to have children easier e.g. facilitating parents to combine career and parenthood. This may take longer than immigration but is a more effective response to aging population. It could also develop many alternative solutions to aging population, some of which it is already doing, including increasing productivity, encouraging work beyond retirement, increasing the rate of returns on CPF savings, or even promoting the adoption of children. Speaker Sir, any easing of immigration policies will naturally lead to Singaporeans questioning the value of being a Singaporean. As things are now, Singaporeans are losing jobs to foreigners here in the face of foreign competition for work in Singapore. We know that employers in Singapore have been employing foreigners in place of Singaporeans. This may not be because they are more talented than Singaporeans but simply be because they are cheaper to hire. This is affecting even skilled workers and professionals. The former Chief Economist of the World Bank, Mr Joseph Stiglitz, notes that due to globalisation, it is no longer enough for governments to tell their citizens to accept lower wages because their lives will improve later, as this simply may not happen. Singapore workers are feeling vulnerable with the double whammy of globalisation and liberalizing immigration. The government should clarify how it will watch out for Singaporeans as it allows more foreigners in. Minister Mentor has told Singaporeans that they would lose jobs to foreigners. What is the government’s answer to these people? Sir, lower income Singaporeans cannot afford to have their wages depressed further. The Household Expenditure Survey shows that 40% of households do not earn enough to meet their monthly expenses. The lowest 30% of households have seen their incomes fall over the last few years. Yet the cost of living continues to rise e.g. the cost of utilities has risen over the last 2 years by 30%, public transport charges have risen. If foreign competition depresses Singaporeans’ wages further, this will surely have dire consequences for many families. The government has listed rooting Singaporeans here as one of its priorities in the new term. The public has also discussed what it means to be Singaporean, with most people talking about landmarks and, of course, the food. But these are surely inadequate answers for why we should be rooted to Singapore. Linda Lim, a Professor of Strategy at the University of Michigan, recently gave a talk at the Institute of South East Asian Studies entitled “Singapore: Place or Nation”. She says that if one treats Singapore as a place, it is a choice of convenience. One chooses to live in a place because it offers a certain standard of life, only to leave for another place if it makes a better offer. The choice is purely utilitarian – one of cost-benefit. In applying this logic, I see the act of attracting foreign talent as something which tends to encourage foreigners to see Singapore as a place, because we too, assess the benefits that they can bring to us. We cannot blame some immigrants for treating Singapore as a place. Immigrants would generally be mobile and may not see Singapore as their final destination. On the other hand, treating Singapore as a nation would entail a sense of ownership, a feeling that you are rooted here to defend the place against external threats; a sense that you should try to improve the lives of fellow citizens even if it calls on you to make personal sacrifices. You do not carefully weigh the pros and cons before acting; your heart tells you that you must do these things. As I hear that the government seeks to root P65ers here, it is basically saying it would like them to treat Singapore as a nation rather than a place. Sir, this can only come about if Singaporeans feel they can make a difference – that they can be agents of change in the society, and on their own terms. My belief is that if this government wants to see people rooted here, there is one thing it can do. No, I am not asking for another government campaign. Instead, the government should repeal the restrictive laws and policies such as restricting outdoor meetings / exhibitions, making of political films and political expression from citizens. There are already criminal laws in place which criminalize rioting and acts of sedition, and laws against defamation. I believe that the government will be pleasantly surprised that Singaporeans are capable of being critical yet loyal to Singapore. Let the police concentrate on counter-terrorism and murders rather than to investigate school girls selling T-shirts with white elephants on them. Let there be an environment which encourages Singaporeans to express themselves about current issues and even make jokes about the government. Sir, at the recent General Elections, a friend at a Workers’ Party rally narrated a conversation he overheard between 2 groups of strangers. The topic of Ministerial salaries had come up, and one group was expressing disbelief at the figures being cited. “It can’t be true”, they said. Another group standing nearby, who was obviously from a different social background, told them that it had to be true, otherwise these things would not be said at the rallies. Then ensued an exchange of views among strangers about whether such salaries were justified, where Singapore was heading and what was good or bad for Singapore. Let us not underestimate the value of such exchanges in building a collective identity and rooting Singaporeans here. Let this be part of our unique culture and another reason why Singapore will be always special to Singaporeans. In short, Sir, let us become as First World as we claim to be. Sir, I support the motion. Sylvia Lim is the chairman of the Workers’ Party, besides being NCMP. 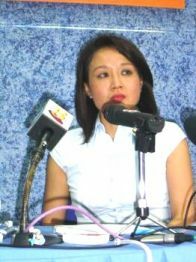 She delivered the above speech in parliament during the President’s Address, 2006.